It's been a long time since a book made me this angry. Thomas Friedman is a columnist for New York Times. 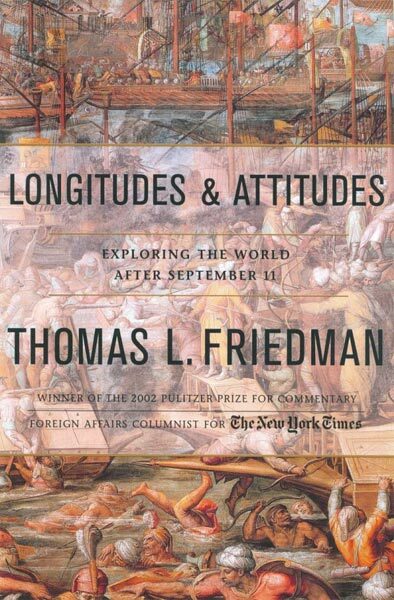 Longitudes & Attitudes is a collection of his columns written between December 2000 and July 2002, followed by a 'diary' concerning the same period (re-telling the same stories and actually re-using the very same phrases). You've guessed it - it's a 'before, during and after' commentary on 9/11. I picked the book because the cover won me over. Exploring the world after September 11, it said. A widely travelled author, who won the Pulitzer Prize not once, but three times. Wow, I thought. That'll be something. I suppose I imagined this 'something' to go along the lines of Ryszard Kapuscinski's or Jan Morris's travelogues, with faint political undertones. What I got instead was a 380-page long volume of propaganda. Ouch. I'm going to force myself NOT to go into the details of what I've read. Get the book yourself, read it, think it through. I'm just too angry, still, and I don't want this review to turn into a fierce political debate. Let me tell you more about my reactions instead. I can't remember another book that would inflame me so much. There was a second when I seriously considered buying a copy, rearranging it with tape and scissors and sending it back to Mr. Friedman to show him how often, as I perceived it, he contradicts his own words. I felt like arguing with almost every second statement in the book. I used a lot of ugly language when describing bits of Longitudes & Attitudes to my partner, so much that he actually told me to put it down and stop shouting. True, I am easily inflamed. I am also allergic to arrogance, self-righteousness and using rhetorical tricks to shape public opinion. Is that bad? Mr. Friedman often complained how other nations don't like America. Well, if all the Americans see the world as he does (which I'm convinced is not true, hopefully/thankfully), dislike is a rather obvious reaction. 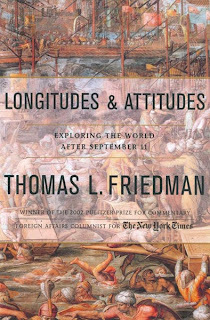 When Friedman is not talking politics, he's actually quite readable - colourful language, interesting anecdotes, focused storytelling etc. I respect the strength of his opinions, in some twisted way I even appreciate his ability to make me this mad. He made me go and check figures re WTC casualties vs Afghanistan war casualties, he ignited my curiosity, fair play to him. Unfortunately, the idea that people like him shape (or reflect? That is the question!) the opinions of the most powerful nation on Earth makes me scared shitless. End of rant for today. Promise to pick my books more carefully in the future.